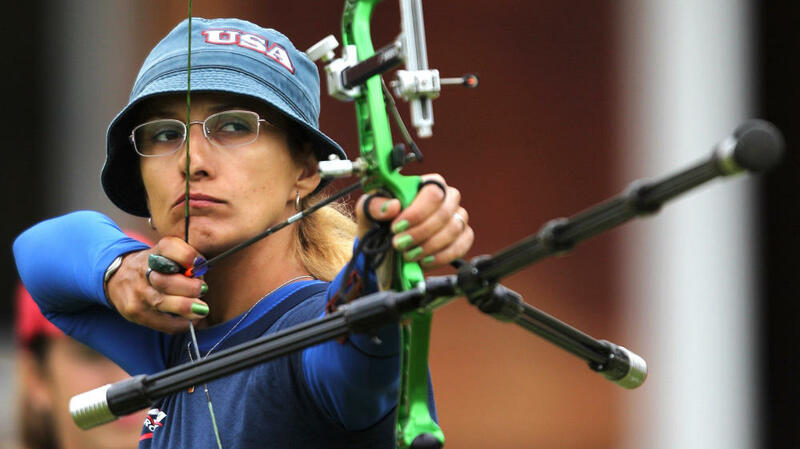 The top-ranked female archer in the United States is a woman by the name of Khatuna Lorig. These days, she's training almost full-time for the Olympics in London, and she's done some coaching as well. Among the athletes she worked with, the star of "The Hunger Games," Jennifer Lawrence, for the movies archery scenes. Alex Schmidt went to watch Lorig's Olympic preparations in the Southern California city of Chula Vista. ALEX SCHMIDT, BYLINE: When she shoots, Khatuna Lorig is a fierce mixture of relaxation and tension. She stands straight up in sunglasses and a hat pulled low over her eyes. Then, she lifts a huge bow, pulling back the string to a tension of 44 pounds. She's alone up here â can't count on any teammates for help - and she likes it that way. KHATUNA LORIG: It's an individual sport. You shot, you ten, you gold and nobody can change. No judge can change that. SCHMIDT: She shoots her quiver at a target so far away I can hardly see the arrows. SCHMIDT: Amazingly though, she calls the shots: four gold in the center of the target at one o'clock; one red, the next layer out, at five o'clock. We walk over to the target. She was exactly right. How did you know when we were standing back there? LORIG: I kind of feel how I released. Shooting 26 years, I'm very much kind of knows - I know my 10 fingers. SCHMIDT: It's been a long road to get to where she is now. Thirty-six-year-old Lorig was born in the Republic of Georgia and discovered archery at school, in the 6th grade. Times were tough when the USSR split up. Lorig would practice shooting in a basement by candlelight. In '96, she moved to the U.S. but missed the 2004 games because she still wasn't a citizen. LORIG: Mentally I was very, very stressed at that time. I knew I could make the Olympics and because no paperwork to try for the U.S., kind of killed my dream for another four years. SCHMIDT: Archery has struggled, too, with a lack of glittery star power. But things are picking up. 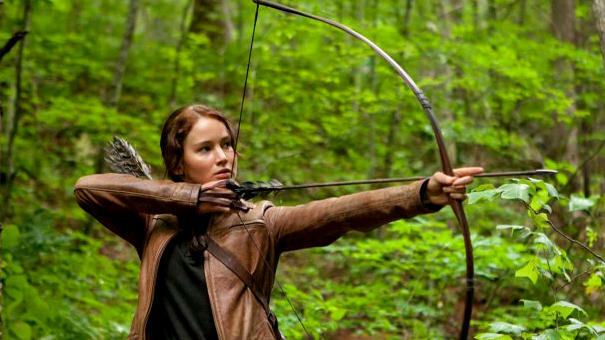 Exhibit A: "The Hunger Games," with a female archer as the hero. SCHMIDT: Lorig herself trained actress Jennifer Lawrence for her role in the film. LORIG: She's the best ambassador we have, sort of Kevin Costner. LORIG: But she's the one. I think she's the one who's going to make archery more visible, which that's what's happening and I'm very happy. SCHMIDT: Thanks in part to big cultural spotlights - Pixar's also releasing a film called "Brave," about a female archer â there's more teen interest in archery. Lorig says, no way it'll be a passing fad. LORIG: Once you start shooting, you're going to like it. Come on, how can you not like archery? You have to be physically strong and you have to be mentally strong. And so, what else you need in your life? SCHMIDT: Lorig is training for the Olympics nearly full-time these days. But for all her hard work, there's one big hurdle left: She might not know if she qualifies for London until June. LORIG: I'm nervous. I'm excited, can't wait. But I do have other things to worry about. I got a husband. I got kids, I got to coach people. I got to keep going shooting. I have to still live, right? SCHMIDT: And that, right there, may be the trademark of a really good archer: relaxation and tension in the very same moment. For NPR News, I'm Alex Schmidt. Transcript provided by NPR, Copyright NPR.